The Philippines has lost its claims over the disputed Panatag shoal because of the blunder of former Foreign Secretary Alberto del Rosario and former President Benigno Aquino III, said an article by Kahimyang.com. 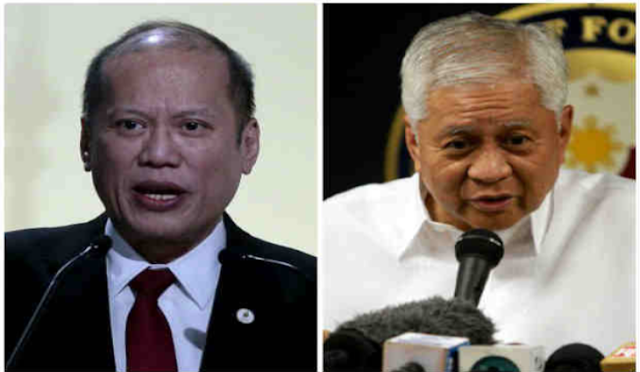 The article read, "In an article posted at the website of the pompously named "Stratbase Albert del Rosario Institute for Strategic and International Studies" - which the billionaire appears to have bankrolled - del Rosario admitted what he and his boss Aquino had hidden from the nation since 2012: We lost Panatag (Scarborough) Shoal, just 124 nautical miles off Zambales, because of their huge blunder." It noted Del Rosario's statement that the US acted as an intermediary between the Philippines and China, which agreed to a simultaneous withdrawal of ships from the shoal, but only the Philippines lived up to its word. It said that the statement is flawed as there was no admission of China or US to the statement. It added that Del Rosario's statement in his article is in sharp contrast to what he said on June 16, 2012, quoted in nearly all media that day two weeks after our ships left the shoal June 3: "Citing bad weather, President Aquino has ordered home two Philippine ships engaged in a standoff with China over Scarborough Shoal." "Until his piece was posted in his website, del Rosario had not himself claimed that that there was an agreement with China for a simultaneous withdrawal of each country's vessels from Panatag." It also noted how former Senator Antonio Trillanes IV claimed it was del Rosario who was responsible for the boo-boo, with Aquino himself blaming his foreign secretary. "PNoy called me to inform me that our two BFAR (Bureau of Fisheries and Aquatic Resources) vessels already left the shoal but China reneged on the agreement of simultaneous withdrawal of their ships, so two of them [were]still inside the shoal," Trillanes wrote in his aide memoire "Backchannel Talks". "Fu Ying, China's vice minister of Foreign Affairs in charge of Asia (who had been ambassador here from 1998 to 2000) met June 1 in Washington with Kurt Campbell, US Assistant Secretary of State for East Asian and Pacific Affairs, to discuss Aquino and del Rosario's request for the Americans to intervene - even militarily, my sources claimed - in the Scarborough Shoal crisis. Campbell relayed President Obama's position that the US cannot intervene in the dispute, and instead suggested a simultaneous withdrawal of vessels from Panatag Shoal (also known as Bajo de Masinloc) to de-escalate the tension. The Chinese official told Campbell that she would relay the suggestion to her superiors in Beijing. However, for some unexplained reason, the then US Ambassador to Manila Harry Thomas that very day told del Rosario that China had already agreed to a simultaneous withdrawal. Del Rosario immediately ordered, in the middle of the night, the BFAR and Coast Guard vessels to pull out, leaving the Chinese in complete control of the shoal. Aquino would only find out about the pull-out when he woke up – a bit late – the following morning. With our vessels leaving what we claim as our territory, we have lost it – forever, as it were." According to the blogsite, China didn't really just grab the shoal from us. He and Aquino let go of it, making the Aquino presidency the first administration to lose Philippine territory it already had control of. "Because of his personal hurt over being hoodwinked - by China or by the US - into losing the Panatag Shoal for the Philippines, del Rosario has been relentless in his and his stable of salaried academics' advocacy that our government adopt an aggressive anti-China stance." The blog then said that luckily for the country, it now has the leadership of President Rodrigo Duterte, whose independent intellect and strength of character prevented the Philippines being steered by del Rosario.